My kids and I spend a lot of time in our garden. It is a lovely place to be thanks to Chris who puts in the hard yards composting, mulching and more. Every few months we visit our local garden centre and buy a few pots of flowers – our favourites are pansies, violets, petunias, marigolds and snapdragons. Both my girls love gardening but I actually adore working in the garden with my youngest (17 months). Boo loves to slowly dig her fingers into the dirt and splash in the water. When Cakey is involved she tends to take over with all her wonderful 3 year old enthusiasm. 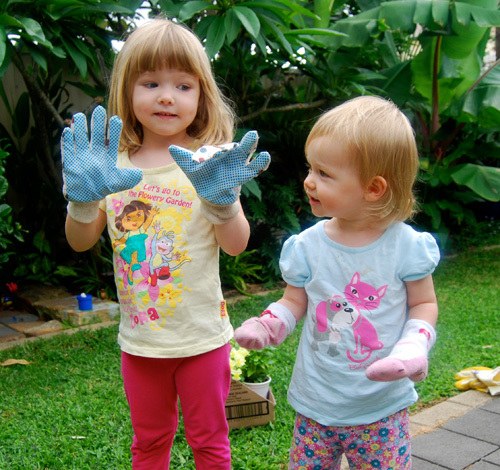 Getting ready to garden – Boo is happy to use Cakey's socks as gardening gloves. This particular planting project included all three of us. 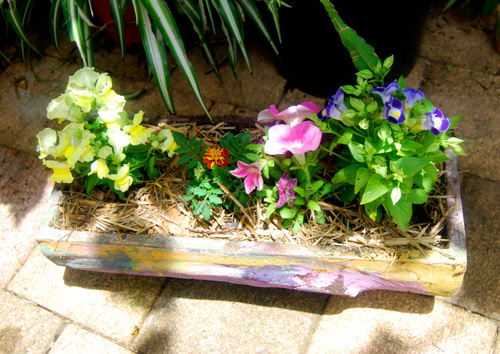 We have a special planter pot for our flowers – Cakey painted it in rainbow colours a while back. First up, we dig out the old plants that have passed their prime. Then we prepare the planter pot by adding in some new soil from our worm farm. 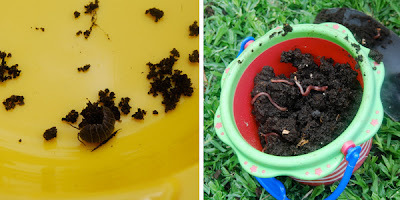 The kids love watching the worms wriggling around in the soil. 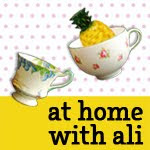 Next is Cakey's favourite bit – adding water and making 'dirt soup'. Once all the water has soaked into the soil, we gently tap the new plants out of their containers and place them into their prepared holes in the planter pot. To finish off, we give them another drink of water mixed with worm tailings and put a little bit of mulch around the plants to keep the moisture in. The end result always looks good and the girls get a kick out of picking the flowers (which just makes them produce more and more flowers). This time around I learnt something new. When we dug out the old plants there were little bugs crawling around – I have always called these bugs earwigs... but they are not earwigs. After our planting was complete, Cakey and I looked up earwigs on the computer and found photos of an entirely different bug. With a little bit of searching we discovered that the bugs in our planter pot are actually slaters. Silly me! According to our search, slaters aren't even insects, they are crustaceans and are related to crabs and lobsters – strange but true! We also found out that slaters feed on decaying vegetable matter and are good for the garden as they return nutrients to the soil. JDaniel would love playing with the worms. I love gardening with the kiddos too! 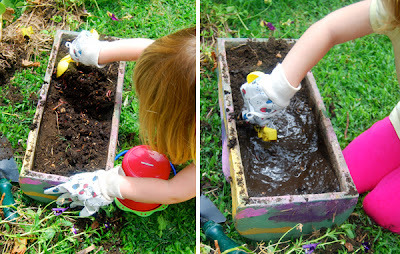 Looks like yours had LOTS of fun w/ this -- and there is always something new to learn w/ the garden, isn't there? Great post! We love gardening, too- We were religious about it until the heat killed our crops. I bet those slaters are related to millipedes- we had a giant african millipede who was 13 inches long and an inch and a half thick. He fed on detritus and served a similar purpose. They are related to roly-polys and cockroaches. :) haha! Geez, a 13 inch millipede sounds frightening. Thanks all for your lovely comments. Lovely! My kids love gardening and seeing things grow. Last year my son really got into it and loved planting sunflower seeds and watching them grow! This is great! I love gardening with the kiddo too. The worms freak him out a bit, hahaha. New follower here from Red Ted Linky. 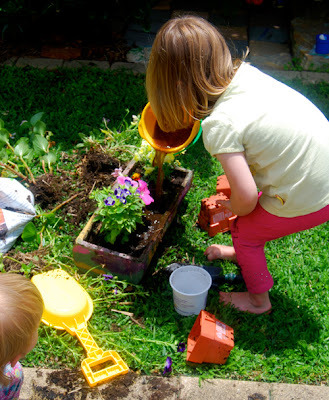 Gardening with kids is great isn't it! I love the idea of using the socks as gardening gloves ;-) And good to know that slaters are good for the garden because we have lots of them! Worm tailings is the liquid drained from the worm farm - in other words it is worm wee. This is so fun! I just love letting my girls help out with flower planting. It is something that a lot of moms won't do because of the mess and the amount of time that it adds to flower planting. So great to see little ones getting their hands dirty!